An undated early horror story, “”The Eye That Saw Death,” was recently unearthed from the Williams Archives at the University of Texas at Austin and published in the spring issue of The Strand Magazine. In March came news that Francesca Williams, the playwright’s niece (daughter of little brother Dakin), discovered a forgotten treasure of memorabilia in her parents’ Missouri basement, with letters going back to the 1920s. Tenn believed that writers, all artists, had several homes. There was the biological place of birth; the home in which one grew up, bore witness, fell apart. There was also the place where the “epiphanies” began—a school, a church, perhaps a bed. Rockets were launched and an identity began to be set. There was the physical location where a writer sat each day and scribbled and hunted and pecked and dreamed and drank and cursed his way into a story or a play or a novel. Most importantly, however, there was the emotional, invisible, self-invented place where work began—what Tenn called his “mental theater,” a cerebral proscenium stage upon which his characters walked and stumbled and remained locked forever in his memory, ready, he felt, to be called into action and help him again. 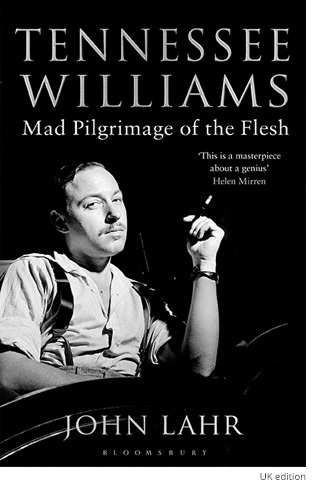 And for National Poetry Month, here’s a podcast from the Poetry Foundation including Tennessee Williams reading his own poetry.